Snoring is caused by a narrowing of the airway in the throat. As we get older and heavier, the throat muscles relax and fatty tissues build up closing the airway (Pic. 1). The velocity of air increases, causing the tissues to vibrate and make the sound we call snoring. Some individuals are born with a narrow airway and hence snore from an early age. Pic 1. Airway restricted during sleep which causes snoring vibrations. Pic 2. SnorBan mouthpiece - Open airway with the forward position of the lower jaw making more space to breathe and preventing snoring vibrations. 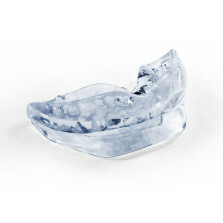 SnorBan® is a mouthpiece specially designed to hold the lower jaw forward (Pic 2.). With the jaw held in this way the airway is kept open so there is no narrowing which leads to the vibration of the throat we know as ‘snoring’. When you use SnorBan® the snoring stops or is considerably improved. More information on how SnorBan® works here.